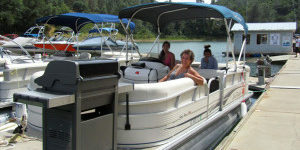 In the boating world a Pontoon Boat is also known as a Patio Boat or Party Barge. 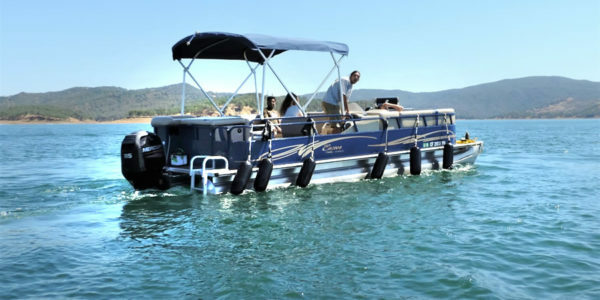 We specialize in Pontoon Boat rentals. 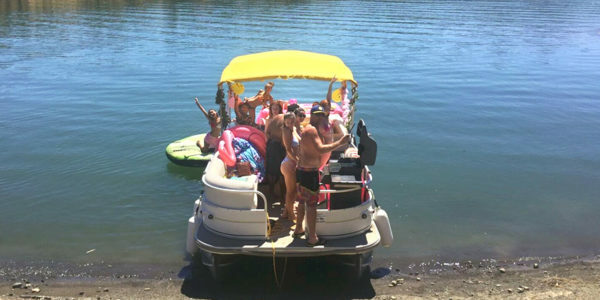 We prefer “party barge” because we’re sure that you’ll have a great time on our pontoon boat rental. 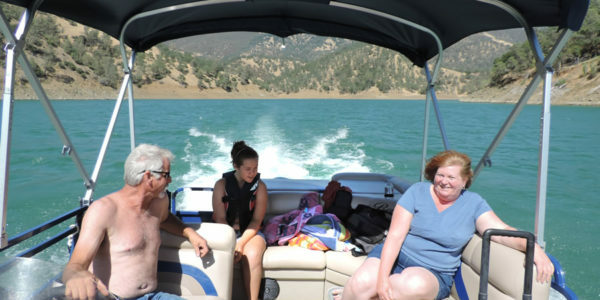 A Pontoon Rental is the perfect way for your group to have a great day on beautiful Lake Berryessa. For added excitement rent one of our jet skis, (also known as waverunners or Seadoos), or one of our Water Ski / Wakeboard boats. Another fun idea would be to rent a Paddle Board to use while anchored in a cove on board our Party barge rentals. Paddle boards are fun for almost all ages. 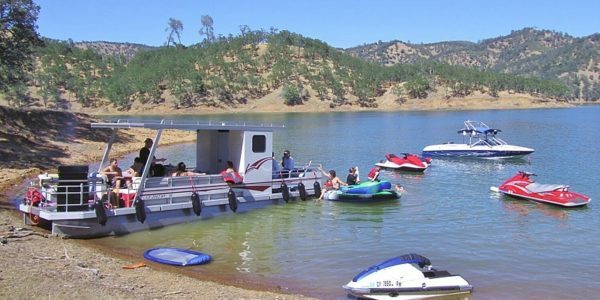 All of our patio boat rentals are fully-equipped with large Weber gas BBQ grills, large awnings for shade, stereos with iPod Plugins, comfortable wrap around seating, and a ladder to get in and out of the water easily. Some of our pontoon boats are also outfitted with swivel fishing chairs, fishing pole holders, live bait wells for a great day fishing. They seat 11 to 14 people and are all unique in their own way. 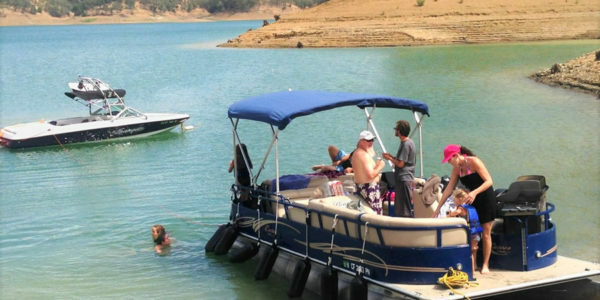 So be sure to read the description of each pontoon boat rental below. *For an extra $60, add a 2 person tube to experience some great fun and excitement for the younger kids. 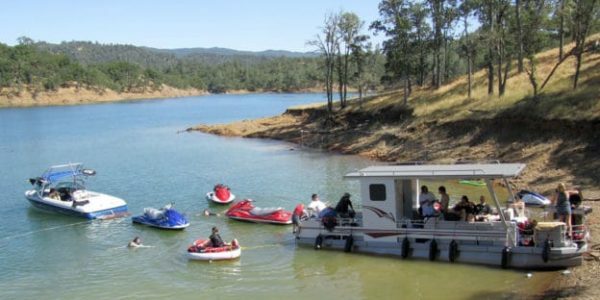 We also have Stand-Up Paddle-boards and Kayaks to rent for you to explore while anchored in the many coves of Lake Berryessa. 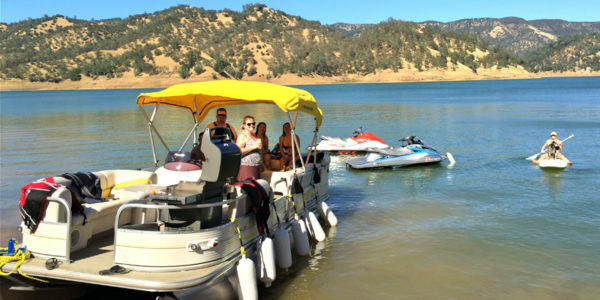 For the faster thrills, rent one of our Jets Skis with the Party Boat, or try tubing, skiing, or wakeboarding behind one of our Competition Ski boats or Wakeboard Boats. 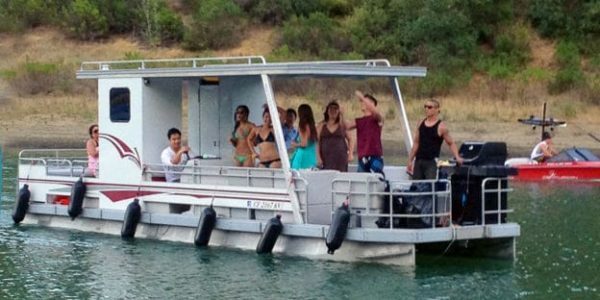 Pontoon Boat 1 - "The Big One"
PB1 is our custom-built 35-foot party barge. Seating 14-15 passengers. It has a large 3 burner weber gas grill, with its 18 foot awning you will have plenty of shade. It has lots of room to walk around, a private dressing / storage room and a lounging pad in the back. It’s also great for tubing with its 150 HP engine. *For an extra $60, add a towable tube, to experience some great fun and excitement for the whole family. For faster thrills, try tubing, skiing, or wakeboarding, wake surfing behind one of our Competition Ski or Wakeboard Boats. Or rent Jet Skis / Wave Runners with your Pontoon Boat. 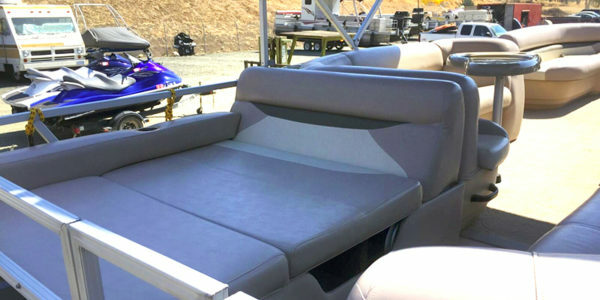 Pontoon Boat 2 - "Tan Top"
New for 2019 is our 24-foot DLX Suntracker party barge. 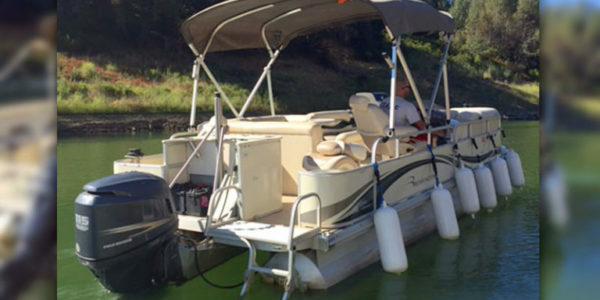 With its Mercury 115 HP PRO SX engine and tow bar it is great for tubing. It is also powerful enough to let the kids or adults under 110 lbs try out knee boarding. 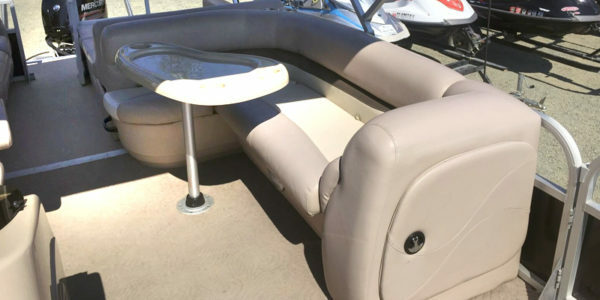 This boat has comfortable spacious seating and a vinal floor. It has a rear facing lounge area seat large enough for two adults to lounge on. 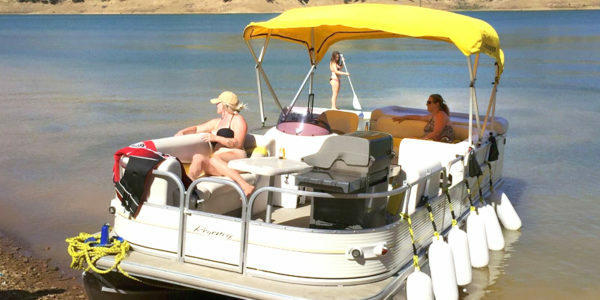 A large awning shades up to ¾ of the boat and aux cord so you can play your favorite tunes. Pack up some deli sandwiches or KFC and some pasta salads for an awesome day of picnicking. For an extra $20.00 you can add a small gas BBQ. This grill is much smaller than our full Weber gas BBQs. This grill is great for simple hotdogs and hamburgers. 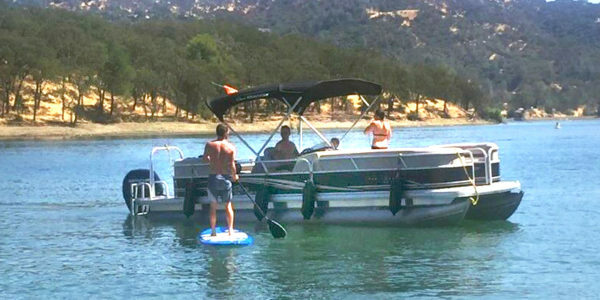 *For an extra $60, add a towable tube to experience some great fun and excitement for the whole family or a knee board for the kids under 110 lbs. For faster thrills, try tubing, skiing, or wakeboarding, wake surfing behind one of our Competition Ski or Wakeboard Boats. Or rent Jet Skis / Wave Runners with your Pontoon Boat. 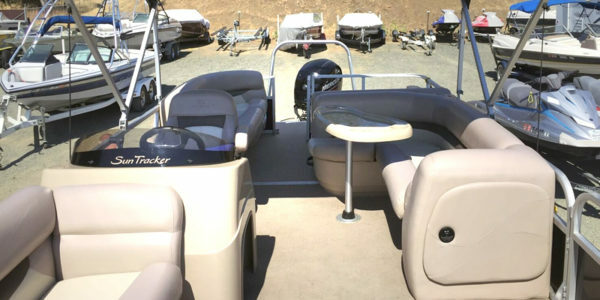 Pontoon Boat 3 - "Black Top"
New for 2018 is our 26-foot Deluxe Suntracker party barge. 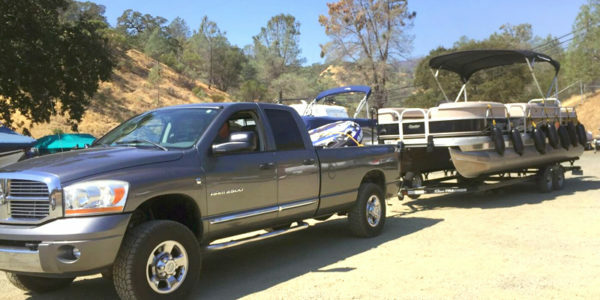 With its 115 HP engine and tow bar it is great for tubing. It is also powerful enough to let the kids or adults under 110 lbs try out knee boarding. This boat has comfortable spacious seating. It has a rear facing lounge area seat large enough for two adults to lounge on. 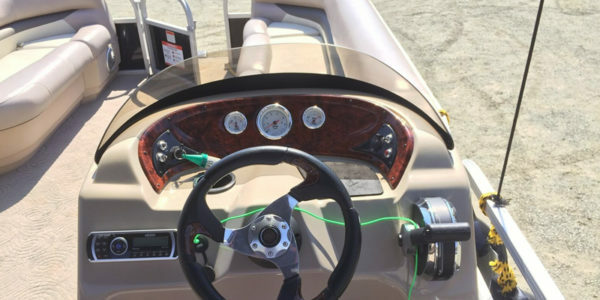 A large awning shades up to ¾ of the boat and aux cord so you can play your favorite tunes. Pack up some deli sandwiches or KFC and some pasta salads for an awesome day of picnicking. For an extra $20.00 you can add a small gas BBQ. This grill is much smaller than our full Weber gas BBQs. This grill is great for simple hotdogs and hamburgers. Pontoon Boat 4 - "Bentley"
Pontoon Boat #4 Bentley is our 25-foot party barge. It seats 12 passengers, has very comfortable lounge seating and a large awning that shades more than half of the seated area. With its 115 HP Mercury engine, your family and friends will have a great time tubing behind this boat. It has a stereo with an auxiliary input to play your favorite music and a large Weber gas BBQ. 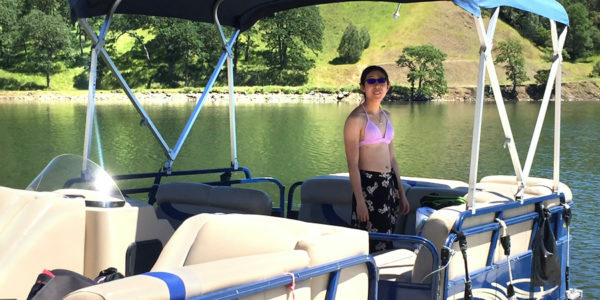 This boat is perfect for taking a relaxing tour of the lake. 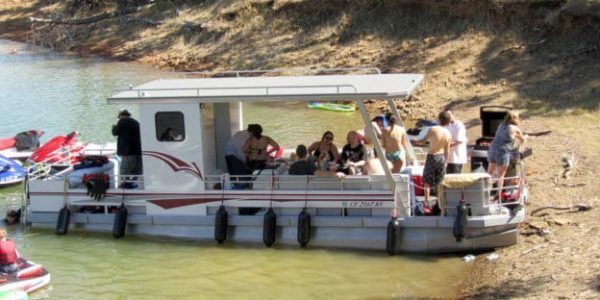 You cant go wrong renting this party barge. 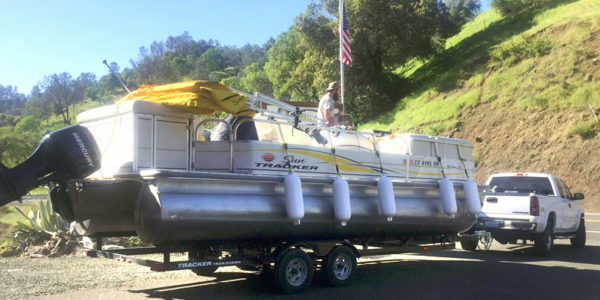 Features: 13 Passengers (12 adults or 13 people w/4 children under 80 lbs) - large awning for shade - large weber gas BBQ - Very Features: comfortable seating - 115 HP engine - 24 feet long - top speed 25 MPH - great for tubing. Pontoon Boat 5 - "Bennington"
Pontoon Boat #5 Bennington party barge / fishing barge 24-foot. 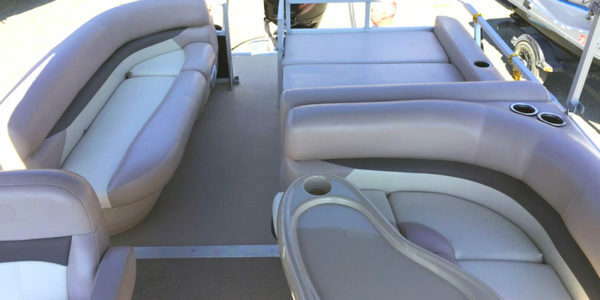 It seats 11 passengers and has very comfortable lounge seating, 2 swivel fishing chairs in the back, fishing pole holders, and a live bait well for the fisherman in your family. Equipped with a large awning for shade and a large Weber gas BBQ. With its tow bar and its 115 HP Mercury engine its perfect for tubing and it is also powerful enough to let the kids or adults under 110 lbs try out knee boarding. Pontoon Boat 6 - "Yellow Top"
Pontoon Boat #6 Yellow Top is our 24-foot Party Barge. It has very comfortable lounge seating and a large awning that shades more than half of the seated area. 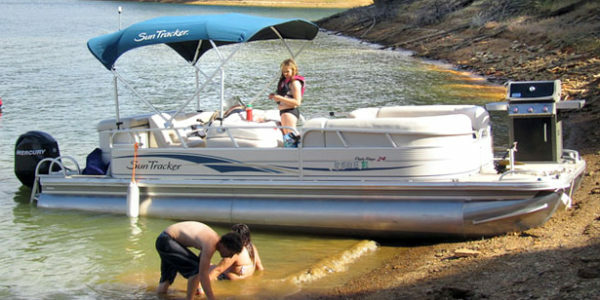 With its 60 HP Mercury engine your kids will have a great time tubing behind this beautiful Pontoon Boat. It has a stereo with an auxiliary input to play your favorite music and a large Weber gas BBQ. 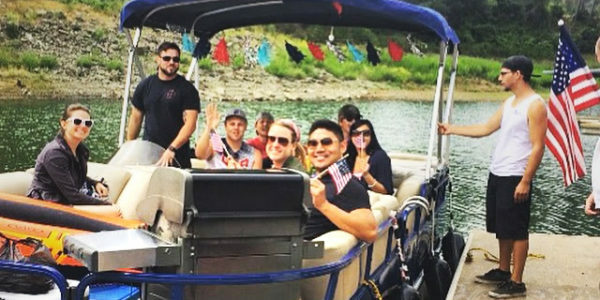 This boat is perfect for taking a relaxing tour of the lake. 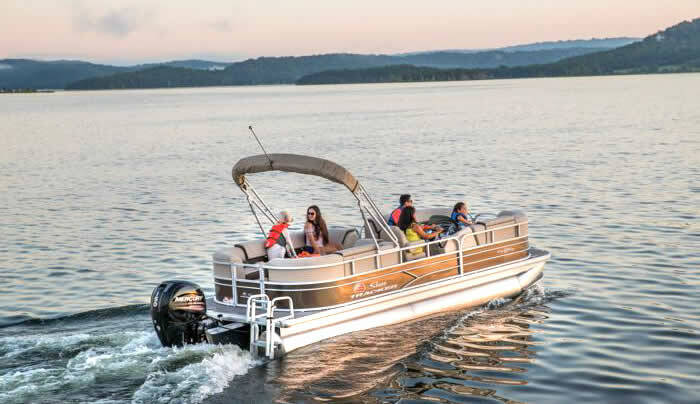 Features: 11 Passengers (11 adults or 12 people with 4 children 80 lbs) - large awning for shade - large weber gas BBQ - very comfortable seating - 60-HP Engine - 24 feet Long - top speed 20 MPH - great for pulling your kids tubing. Pontoon Boat 7 - "Blue Top"
Pontoon Boat #7 Blue Top is our 26-foot party barge. 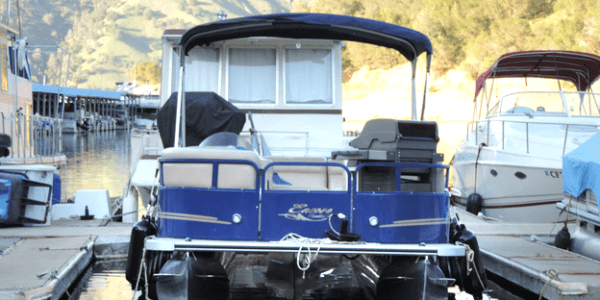 It has one swivel fishing chair in the front and lots of lounge seating. It also has a large Weber gas BBQ & large awning for shade. 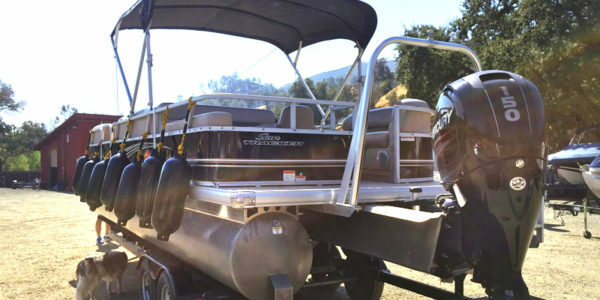 It has a two foot deck area in the front and rear of the boat great for fishing and jumping in the water. It is powered by a 90 HP Mercury engine. 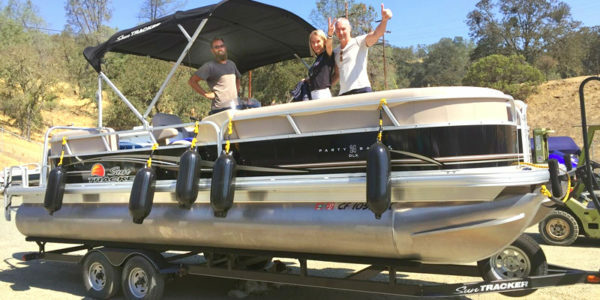 This party boat will be fun for pulling a tube for kids and adults! 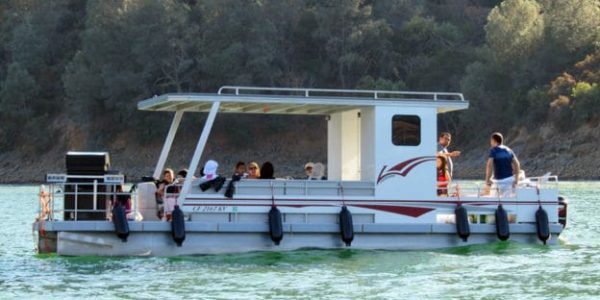 Features: 10 - 11 Passengers (11 adults or 12 people with 4 children 80 lbs) - large awning for shade - large weber gas BBQ - comfortable seating - 90 HP engine - top speed 25 MPH - 26 feet long - great for tubing. **For an extra $60, add a towable tube, to experience some great fun and excitement for the whole family. For faster thrills, try tubing, skiing, or wakeboarding, wake surfing behind one of our Competition Ski or Wakeboard Boats. Or rent Jet Skis / Wave Runners with your Pontoon Boat.